Glasgow has a fine tradition of Italian restaurants. This reflects their strong community in the city... and our love of the sun! For four years running I couldn't rip myself away from Italy for trips and holidays. In fact I remember pressing my nose up against a few estate agent windows peering at the little bolt-holes on offer and dreaming up my new "vida loca". So, still in Glasgow for now, I do love to fuel these passions in the only way I can - and that's to "eat my dream". Sometimes you're in the mood for a quick pizza. Other times, the thought of bruschetta buried under sweet tomato, mozzarella, garlic and olive oil is enough to make you potty! Glasgow's best places sparkle and shine, full of happy locals getting stuck into family sized pizza, or getting cosy over a romantic dinner. 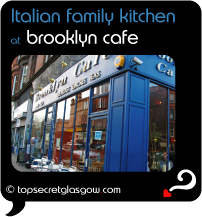 To say that eating the best from Italy here in Glasgow means you've got it all, really is true. I LOVE their food. And wine. And... (well, I'll leave the rest to a proper feature for later). Great news! Finding this page means you can now join our VIP list for EAT Italian. Amarone delivers stylish Italian dining and chic surroundings, in Glasgows shopping paradise. Ideal for pre-theatre, romance and business. Time to grab your very own page for EAT Italian. Do you have a special story about a time you decided to EAT Italian? A funny experience? A grand occasion? A funky photo? A personal tip? A top secret?